Tour Antelope Canyon in the only day-tour available from the Phoenix/Scottsdale area! In one day, tour Antelope Canyon, Horseshoe Bend and the Navajo Nation. Experience one of the most picturesque slot canyons at Antelope Canyon before taking in the breathtaking views of Horseshoe Bend, among other sights and sounds of the American West. 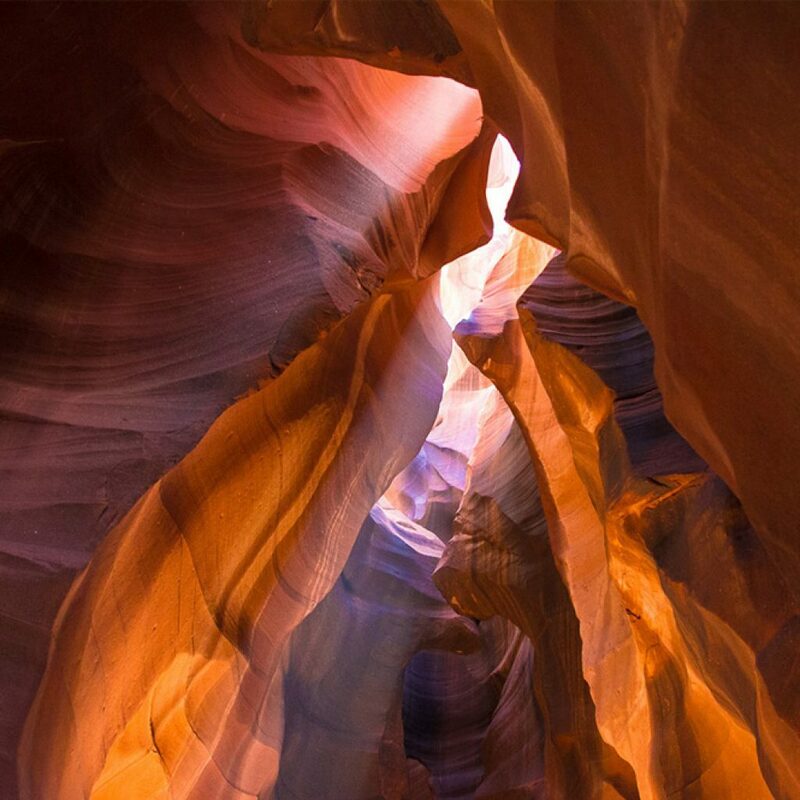 This guided tour of Antelope Canyon from Phoenix departs the Phoenix/Scottsdale area between 4:00am and 5:00am and returns between 6:30pm and 7:30pm that evening. Antelope Canyon tours are available from Phoenix every week on Thursday and Saturday. From the Phoenix/Scottsdale area, our route takes us through the Sonoran Desert up into the picturesque mountain town of Flagstaff. This historic Route 66 town lies at the base of the largest mountain range in Arizona, the San Francisco Peaks, which we will be able to gaze upon as we continue to travel north to the Lake Powell region. Along our way, we will enjoy a visit to a Navajo Trading Post and explore Navajo culture and their intricate crafts. Upon arrival to Page, Arizona, we will begin our tour of spectacular Lower Antelope Canyon. * Here, we will tour Lower Antelope Canyon with a local Navajo guide who will lead you through the amazing natural formations of this world famous slot canyon. The photo opportunities will be second to none! In addition to touring Lower Antelope Canyon, we also include photo stops along the majestic Lake Powell shoreline before stopping for a group lunch in Page at one of their unique eateries. After our time in Antelope Canyon and Page, we will embark upon a scenic one-mile walk to Horseshoe Bend Overlook which is highlighted by awe-inspiring views into this deeply carved channel and the Colorado River below. Photos from the edge of this natural beauty are widespread across the world and are nothing short of amazing. Temperatures in Page are typically 5-10°F cooler than in Phoenix and vary by season. We recommend our guests bring jackets in the event of changing weather patterns. We were picked up at 5am and returned at 6:30pm. This was an amazing way to see Antelope Canyon and Horseshoe Bend! One of the coolest things we've done while living in AZ for 30 years. Highly recommended! We had 2 Detour guides with us and we enjoyed our time with them and the rest of our group who were from all over the world. I booked a tour with Detours to Antelope Canyon....WOW amazing! Our tour guides Mark & Brendan were great, very helpful and full of knowledge! Antelope Canyon was breathtaking and so were the other view stops we made! Great lunch provided, the driving was great and the tour van was very comfortable! The guides go way out of their way to make sure everybody on the tour was comfortable and happy!!! I would HIGHLY recommend this tour to anyone visiting AZ!!!! Well worth the price!! We provide a variety of fruit, pastries and protein bars. Lunch is ordered from a local restaurant in Page. You have a choice of a variety of burgers and sandwiches. Pick up times range from 4am-5am. We will contact you between 4-6pm the evening before the tour to confirm your exact pick up time.